In a response to the current volatile situation in the Middle East co-authors David Orme-Johnson and David Leffler ask if we want to continue repeating history, killing and destroying to solve political problems, or transform ourselves with a more enlightened alternative approach that’s been scientifically proven to create peace. Read this paradigm-shifting Op-Ed piece on how we can put an end to war and create permanent peace: Reducing Tension in the Middle East. It’s being posted on news websites and online journals around the world. The AsiaN published it as Transcendental meditation proved helpful in solving enmity among nations. The Israel Herald published it under: Lasting peace in Middle East may need warring parties to meditate, and the Palestinian News: Meditation cited as possible remedy to reduce tensions in Mideast conflict. Here is a list of publications under dates in the countries where the article was published, over 50 times so far: Israel, Afghanistan, Romania, UK, Nepal, USA, Pakistan, Greece, Cyprus, Ghana, Liberia, Balkans, India, Ivory Coast, Africa, Australia/Tonga, Canada, Jordan, Balkans, Palestine, South Korea, Kashmir, Ireland, China, South Africa, Egypt, Germany, France, Denmark, Spain, Thailand. Check them all posted here: Op-Ed Piece “Reducing Tension in the Middle East” by Drs. Orme-Johnson and Leffler is Available Worldwide in over 50 Locations. For more information on this powerful benign approach, see: The Power of The Collective, by John Hagelin and John Hagelin — “Only Higher Consciousness Can Transform Our World” — Beyond Awakening Blog. Here are reports: Group Meditations Reduce Crime, As Predicted and Explanation to Steady Decline in Major Crime in the US. Hard evidence grows for including meditation in government-sponsored health programs was released on EurekAlert! October 17, 2012. More people still die from cardiovascular disease than any other illness. Dubbed the number one killer and the silent killer, modern medicine has been researching and incorporating complementary and alternative approaches to help treat and in some cases reverse and hopefully prevent this health problem at an earlier stage of the disease. One of those modalities is meditation. A new research review paper on the effects of the stress-reducing Transcendental Meditation (TM) technique on the prevention and treatment of heart disease among youth and adults provides the hard evidence needed to include such evidence-based alternative approaches into private- and government-sponsored wellness programs aimed at preventing and treating cardiovascular disease. The paper, “Prevention and Treatment of Cardiovascular Disease in Adolescents and Adults through the Transcendental Meditation® Program: A Research Review Update” is published in Current Hypertension Reviews, 2012, Vol. 8, No. 3. • In teens, the TM technique has been found to reduce blood pressure, improve heart structure and improve school behavior. According to the paper, the technique has been shown to be a safe alternative. The NIH-sponsored clinical trials conducted with TM mentioned in this review did not observe any adverse effects from TM practice. • In adults the technique reduced stress hormones and other physiological measures of stress and produced more rapid recovery from stress, decreased blood pressure and use of blood pressure medication, decreased heart pain in angina patients, cleared the arteries, reducing the risk of stroke, improved distance walked in patients with congestive heart failure, and decreased alcohol and tobacco use, anxiety, depression, and medical care usage and expenditures. The technique also decreased risk of death from heart disease, cancer, and all causes. “These findings have important implications for inclusion of the Transcendental Meditation program in medical efforts to prevent and treat cardiovascular disease,” says Dr. Vernon Barnes, lead author and research scientist at Georgia Health Sciences University, in Augusta, Georgia. “This review is potentially more important than individual research papers because it shows that TM has an integrated, holistic effect on all levels of cardiovascular disease,” says co-author, Dr. David Orme-Johnson. Orme-Johnson says that no other meditation technique has been shown to produce this constellation of changes, especially when it comes to hard measures of cardiovascular disease. 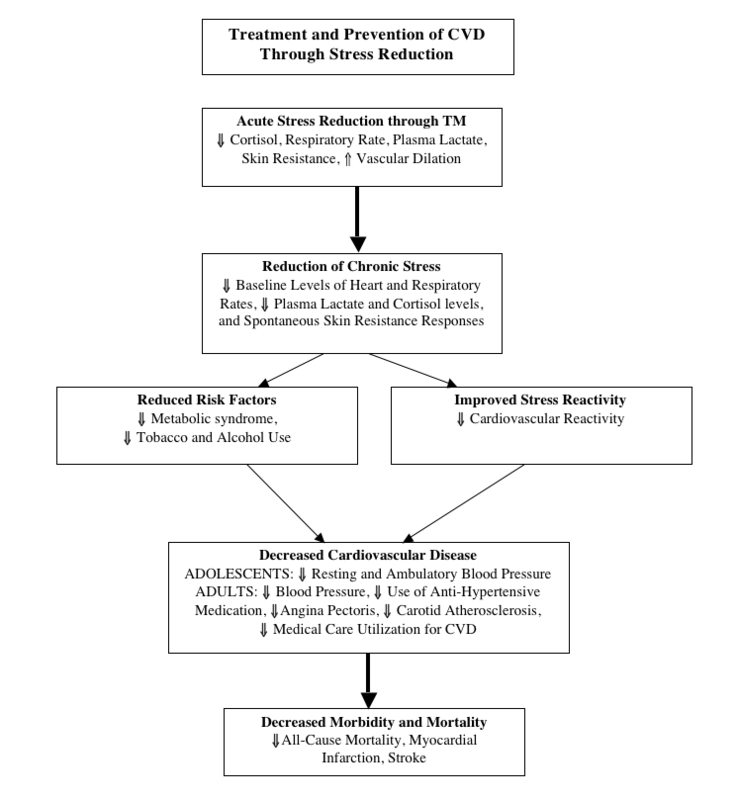 This model shows how regular practice of the Transcendental Meditation Program may reduce chronic stress, which in turn reduces CVD risk factors and improves stress reactivity, thereby decreasing cardiovascular disease, and consequential morbidity and mortality. A paper in Consciousness and Cognition discusses three categories to organize and better understand meditation. See Are all meditation techniques the same? The two common categories are focused attention, concentrating on an object or an emotion, like compassion; and open monitoring, being mindful of one’s breath or thoughts, either contemplating the meaning of them, or just observing them. Transcendental Meditation uses a different approach and comes under the third category of automatic self-transcending, meditations that transcend their own activity. For a clear comprehensive understanding see Transcendental Meditation Visualized [Infographic].